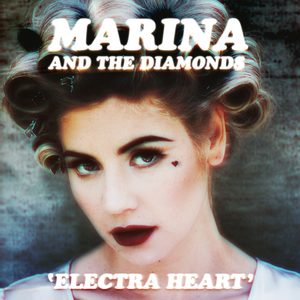 ‘Electra Heart’ is the new 2012 release from Welsh singer-songwriter Marina and the Diamonds and by the mouth of Marina herself, it is her response to rejection in love. Creating four archetypes, or characters (the Primadonna, Teen Idle and Homewrecker, to name a few), the whole thing is quite poorly constructed. She creates these characters but fails to actually achieve a effective end point. You’ve got songs such as ‘Teen Idle’, contemplating Marina’s own youth and then songs like ‘Homewrecker’ which is an altogether different character. While the idea of archetypes is interesting if not slightly pretentious, the characters seem to have little relation to one another and are actually quite disjointed and separate from one another. Either write songs about your life or create a whole concept album. It’s just inconsistent if you do both. Speaking as a long time fan, there is a massive shift in morals. Her debut album, ‘The Family Jewels’ was about judging popular culture as well as promoting feminism (on ‘Girls’, she refuses to “bend over and courtesy for you”) and now she’s talking about being a “bottle blonde”. Understandably, this is a concept album but I genuinely believe she’s using the fact that she’s aiming to portray the 70’s type American dream as an excuse to completely change your image and sound. Diamandis has stated that she wasn’t happy creating music all by her stony lonesome, so she hired some top producers (who have worked with the likes of Katy Perry and Rihanna) to work on ‘Electra Heart’, which explains why her music sounds so poppy. On her debut album, you would find that she had more simple, piano-driven melodies supported by her strong vocals. However, on ‘Electra Heart’, it seems like the music is doing all the work for her – which is why her vocals don’t sound as quirky and strong as previously and the heavy beats and electronic sounds do most of the work. It seems to me these producers have perverted the sound of Marina and I’m not sure about you but this is a Marina I don’t want to see continue. Lyrically, Diamandis could have done much better. The lyrics on ‘The Family Jewels’ were much more memorable and effective. Yet, on Electra Heart, her lyrics seem to cater more to popular music. She sings ‘when you’re around me, I’m radioactive.’. I don’t know about you, but that sounds like a billion other pop songs out there. It seems like Diamandis is catering to the pop genre and completely abandoning the quirky, indie style that she had introduced us with. Why introduce it to us if you’re going to completely take it away from us? Fans expected an album much like the debut, yet they were shocked to find it’s nothing of the sort. However, Diamandis really comes into her own on the calmer, more acoustic sounding songs of the album. Songs such as ‘Starring Role’, ‘The State of Dreaming’, ‘Hypocrates’ and ‘Buy The Stars’ (Deluxe edition) offer a much slower-paced, simpler side to the album. If you get a chance to listen to her acoustic versions of tracks from the album on YouTube, you’ll see it’s stripped free of any jarring electronic beats and is a cry back to her roots as a singer. I sure hope she releases an acoustic album, because it’s definitely better than the original. Marina is an example of a talented singer/songwriter, and I believe she has so much more potential than this. It’s fine to experiment but I pray to whatever God they may be that this does not last.